On the first of September 2014, Livio Felluga is turned hundred years old. Livio Felluga embodies the history, heritage and values of the ancient craft he plies in Friuli Venezia Giulia. Located in the north-east Adriatic, where the Mediterranean meets Central Europe, the region today is renowned for producing some of the world’s finest white wines. In celebration of this very special birthday, Livio Felluga’s family and winery have organized an international event that combines wine, art, science and architecture. – The presentation of 100, a specially created limited-edition wine dedicated to Livio Felluga. 100 reflects the life of a far-sighted modern man whose intuition and love of the land defied the events of his time to revive Friuli’s hills, in the conviction that the only way forward was to grow crops of the very highest quality. Livio Felluga’s long journey, which began in the vineyards of Isola d’Istria, has been characterized by hard work, determination and passion. Over his century-spanning life, Livio Felluga has created one of Italy’s most influential wine enterprises, earning the unanimously acknowledged title of “Patriarch of Friulian Wine”. To mark this unforgettable milestone, The Livio Felluga Company referred to art and architecture. Vigne Museum by Yona Friedman and Jean-Baptiste Decavèle with D/A/C is the result. It embellishes Livio Felluga’s hill country at Rosazzo. 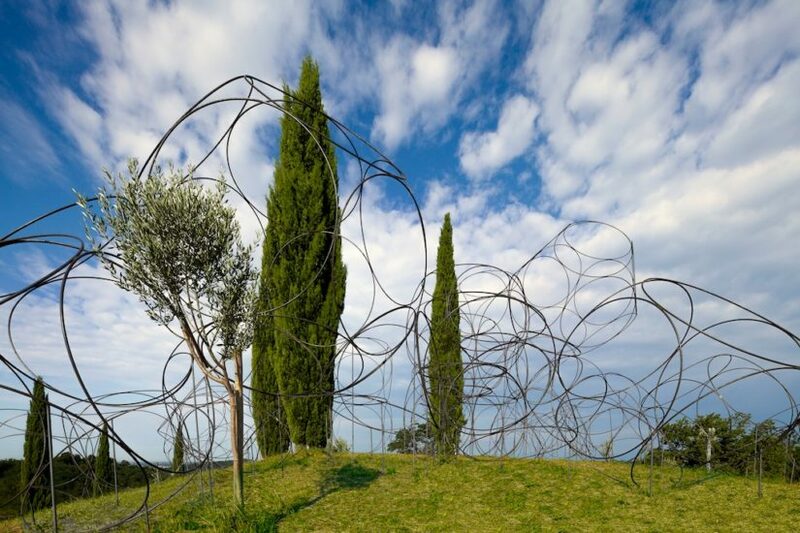 A huge Iconostase, Yona Friedman’s signature architectural structure, has been erected among the vines to become an integral part of nature and the landscape . Also the conference took place at Rosazzo Abbey, near by the Vigne Museum. It was the first appointment to give content to the project. Many important guests were invited: Lorenzo Bendetti (director at de Appel arts centre in Amsterdam); Jean-Baptiste Decavèle (artist, author of the Vigne Museum together with Yona Friedman); Stefano Mancuso (plants neurobiologist); Mauro Pascolini (geographer and director of Literature Department at the University of Udine), Mario Pieroni and Dora Stiefelmeier (RAM radioartemobile). Moderator Adriana Polveroni (Director of Exibart, independent curator and writer). During the conference a short version of the video reportage “Livio Felluga 100” by Luigi Vitale was shown to the public.